Although I’ve been using Dropbox for over a year, the popular cloud-based file syncing service only reached version 1.0 two days ago. The version 1.0 update includes many performance upgrades, bug fixes, and even some new features. For those who haven’t heard of Dropbox yet, head over here to read our full review. If you are already a user, keep reading for details on the latest release. To stay true to the product’s minimalist nature, the developers rebuilt the entire framework to improve efficiency. For instance, Dropbox claims a reduction in memory usage by up to 50%, however I didn’t notice any change in RAM consumption on my Windows 7 laptop. The service hovered around 30 MB before and after the update. In addition the installer size for Mac OS is now 20% smaller because Dropbox runs solely on Cocoa, Apple’s native programming API, allowing for a seamless experience. Another big new feature is selective sync. This tool will come in handy for customers that use Dropbox with devices that have limited storage space. Users can now exclude syncing of specific folders in their Dropbox. For instance, a 5 GB folder can remain on the Dropbox cloud without having to reside on your machine. One thing notably lacking is the option to sync multiple folder locations. 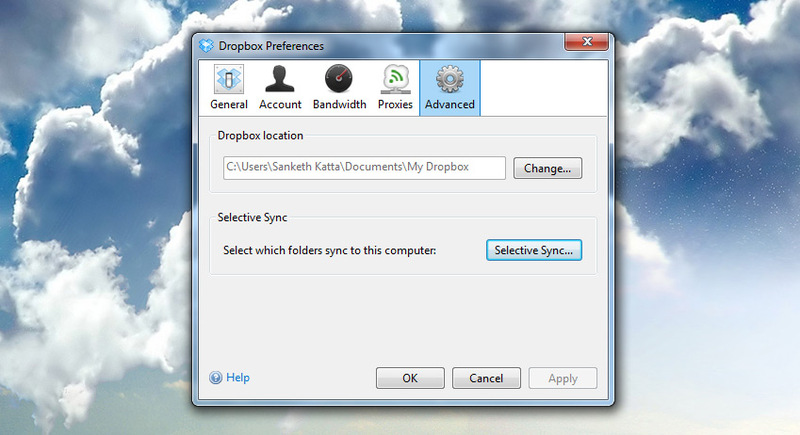 Competing services, such as SugarSync let users sync any folder on their computer. Dropbox unfortunately limits users to a single folder. Thankfully Dropbox has acknowledged this limitation and is working on a solution since it was the most requested feature on their user-submitted feedback site, Votebox. Although there is no mention of a release date, we can only hope that it will be available soon. Also highly requested on Votebox is file sharing permissions. Currently, every member of a shared folder has complete control over adding, modifying, or removing data. This feature would let the folder’s owner to limit certain members to “read-only” privileges. This tool is a necessity for business users or large groups who want to prevent accidental modifications or tampering. This feature is also in the pipeline. While this is a major milestone for Dropbox, the company needs to continue to innovate to stay ahead of advancing competitors such as Box.net, SugarSync, and Windows Live Mesh. With a small footprint and a simple intuitive experience, Dropbox is still a favorite. Older versions of Dropbox will eventually auto-update to the latest version. However if you want to upgrade right away follow the link below. Version 1.0 will not disappoint.